By Sending A Comment To The MN DNR Today. This is very exciting. The Woodtick Wheelers ATV/OHM Club has now reached Step 4 of the MN DNR’s 7-step process to create a Grant-In-Aid ATV Trail. Our club has been working on this trail proposal for 3-1/2 years. Phase I, which we are working on now, is 12 miles long and connects Whipholt to downtown Longville. Phase II will connect Whipholt to downtown Hackensack. Phase III will connect Hackensack to the ATV trails in the Foot Hills State Forest a few miles to the west. We have held over 30 meetings on this project, attended by over 20 club members! Many of these meetings were held to inform the public on the benefits of a GIA Trail, and obtain resolutions of support from the townships and cities along the route, as well as the Chippewa National Forest and two snowmobile clubs, whose trails are involved on the proposed route. We are now on Step 4 and need your support! Step 4 is a 30-day public comment period. That means the MN DNR is now accepting comments pro and con about our trail proposal. There are individuals in the area who are against motorized recreation of all kinds. They will be commenting, as will environmental groups outside the area whose only interest is keeping the public off of public lands. Your support is critical, and it will only take a minute to send in a comment. The DNR and Cass County (our funding sponsor) need to know that there are a lot of people in favor of the trail. The more comments the better. A form letter is not a good way to go, because 100 form letters only count as one letter. So it's best for each comment to be different and personal. Your comment can be as short as "I am in favor of the Woodtick Wheelers trail proposal because it's good for the community." -The proposed trail turns what is now a legal ATV “route” into a managed ATV “trail” that is family-friendly, complete with signing, trail maintenance and a trail map. -The proposed route connects the towns of Whipholt and Longville, so families can ride their ATVs from homes, cabins, resorts and motels to the restaurants, stores and businesses, as well as enjoy other recreational opportunities, such as the sandy beach and picnic area on Leech Lake. -Provides a local club to serve as the champion of the trail system, its funding and maintenance. It was recently named “Club of the Year” by NOHVCC, and works hard to promote safe, responsible OHV riding in the community. -Provides funding for administration, signage, maintenance (grading, dust control, approach hardening, etc.) and other expenses along the trail route. -Protects natural resources by keeping riders on an approved, clearly signed route, designed to DNR specifications to be environmentally sustainable. -Directs families along a route they know will be well maintained, and signed as to what vehicles are allowed and not allowed. -Increases safety and compliance on Township Roads and Forest Roads that form the route, including monitoring by DNR-certified volunteer Trail Ambassadors, with reports provided to DNR enforcement. -Provides tort protection to Townships and County by redirecting liability to the State. -Provides an annual review of the travel route, its use and resource protection. Please send in your comment today. The public comment period ends on Friday, January 24th. Please submit your written comment by email, fax or mail. Be sure to include your name and email or mailing address. If you have any questions, please call or email Dave Halsey at email: dvhalsey@aol.com phone: 612-723-1987. 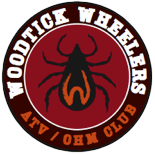 Thanks for supporting the Woodtick Wheelers in our effort to create a positive future for OHV recreation in Cass County!